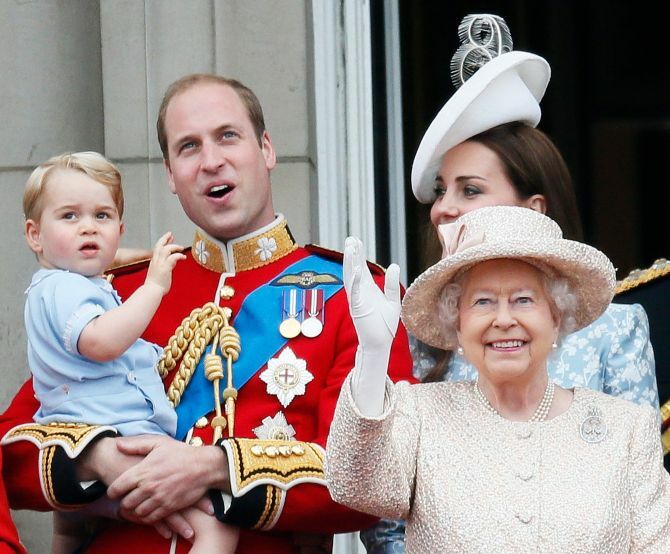 An excited Prince George watched his first Trooping the Colour parade to mark his great grandmother Queen Elizabeth II's birthday in London. 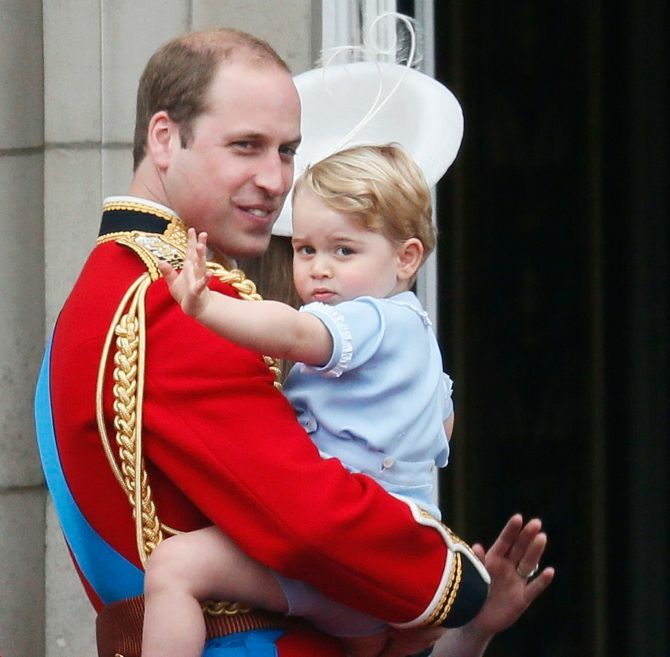 The two-year-old, third in line to the British throne, watched from a window at Buckingham Palace as the Queen travelled by a horse-drawn open carriage alongside husband Duke of Edinburgh. 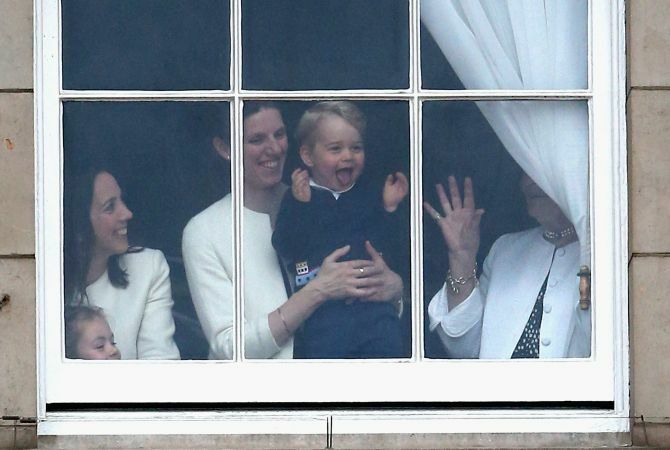 Prince George later joined the royal family on the balcony of the palace to wave to the crowds. His mother Kate Middleton also made her first royal appearance since the birth of sister Princess Charlotte last month to mark the traditional event held in mid-June to commemorate the Queen's actual birthday on April 21. Hundreds gathered to witness the ceremonial ride and loud cheers went up as a carriage carrying the Duchess of Cambridge Kate, the Duchess of Cornwall Camilla and Prince Harry left the palace. Prince William rode on earlier on horse-back with his father Prince Charles. 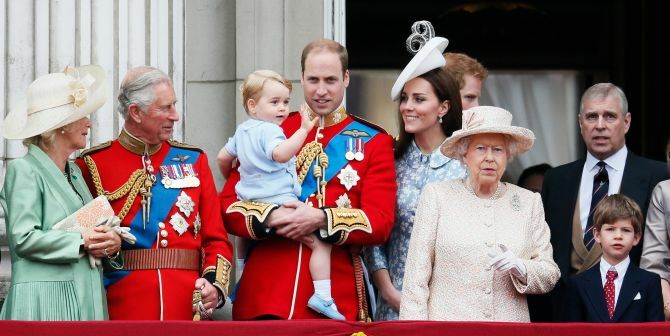 The event marked the first time the Queen has been seen at her birthday celebrations with her heir Prince Charles and heirs apparent -- Prince William and Prince George. More than 1,000 soldiers took part in the traditional display of army drill, music and horsemanship. The Royal Air Force said most of the flypast had to be cancelled due to bad weather. 'Trooping the Colour' has its origins in traditional preparations for battle. Colours, or flags, were carried, or "trooped", down the rank so that they could be seen and recognised by the soldiers. In the 18th Century, guards from the royal palaces assembled daily on Horse Guards to "troop the colours", and in 1748, it was announced that the parade would also mark the sovereign's official birthday. The Queen's actual birthday was on 21 April, when she turned 89. The Duke of Edinburgh celebrated his 94th birthday on Wednesday. It is the 63rd time the Queen has attended a birthday parade, a record unmatched by any monarch. Joined by all other senior royals, the monarch inspected 1,100 soldiers of the Household Division at Horse Guards Parade.